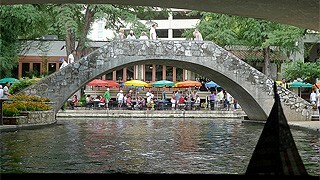 Police in San Antonio, Texas are saying a female tourist was mugged along the city's famous Riverwalk late Monday night in the third incident in the same area over the past few weeks. According to a local news station, the 64-year-old tourist from Salt Lake City was walking with two other women when she was knocked to the ground and robbed of her fanny pack. The woman hit her head and was taken to the hospital to be treated for cuts, and is said to be in good condition. Two weeks ago, a 26-year-old man was stabbed when he took a stroll outside of his downtown hotel one morning and was approached by a homeless man who asked him for cigarettes. When the tourist refused, the homeless man stabbed him in the chest, police say. The man was last reported in table condition. A 69-year-old man was stabbed three weeks ago after he refused to hand over his wallet to a young man who approached him along the Riverwalk just after dusk. He was sent to the hospital with minor injuries. Investigators say they are still looking for the assailants in all of these stabbings.